Being a mom is one of the best – and hardest jobs in the world. It helps no one when we pass criticize and become a judgy mom. Here’s my response to one such mom. I’m not sure why this rubbed me the wrong way. Usually, I have a pretty good understanding that people have their own opinions and will sound off. Usually, I can blow it off and scroll on by. Usually, I don’t take it personally. But for some reason, I took this personally. This one got its claws in me and gave a good twist. What, you ask? This. Maybe it was the tone. Maybe it was the assumptions being made. Maybe that it was just wrong. Maybe it was that smug drawing. I don’t know. But it got me feeling like I somehow needed to explain myself, and that alone made me mad. On behalf of all the moms out there who are ‘detachment’ moms, I feel that I must address your cartoon and let you know how wrong you have this. Let me speak for myself first. First, I have twins. I have always used a stroller and rarely carried. I never felt that I was a detached parent. I never felt that my boys were lazy. I never felt that my sons were ‘cast off’ because they were in the stroller. 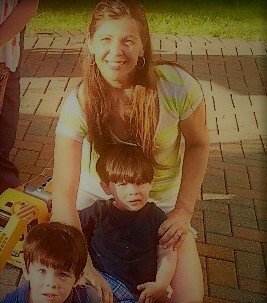 I took advantage of every opportunity to hold my baby boys close as much as I could. Doing that with two of them and one of me was challenging. I just couldn’t (logistically – I couldn’t) carry while we were out. To be honest, not being able to carry my babies as much as I wanted to was a downside to having twins. I felt like I missed out in that area – and so did my boys. I carried when I had another person with me. I even tried the front/back carriers, but neither of them loved being on the back. Carriers didn’t work for us. Was I a detached mom because we used a stroller instead? That thought never, ever entered my mind. It was just practical. And the boys, by the way, loved it. They loved being pushed, and they loved being able to look in every direction to see the world around them. 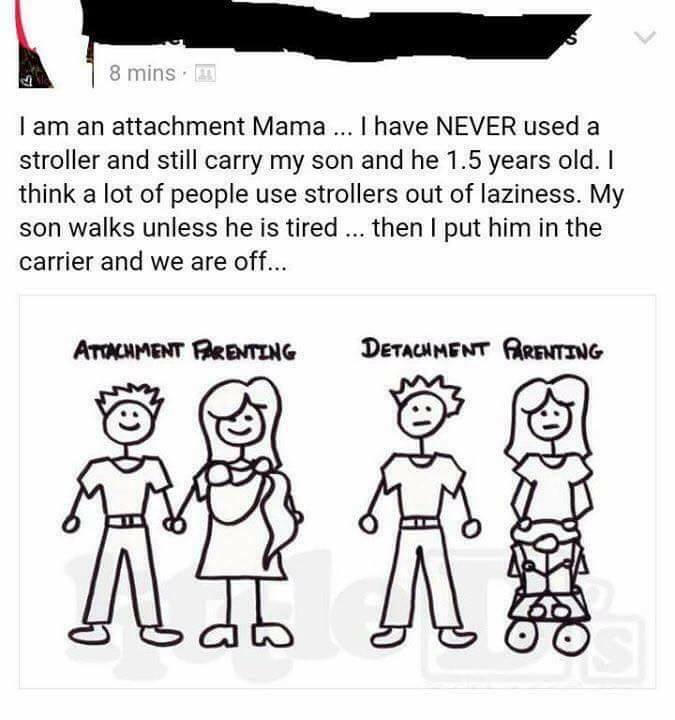 And I’d even guess that some attachment moms actually own strollers, too. Imagine. Second, can’t a baby being carried be just as lazy as baby in a stroller? But I can’t even spend more than a sentence or two addressing this absurd statement. Neither baby is lazy – they are babies!!! And if they were lazy, wouldn’t being carried make him just as lazy as a baby being pushed? 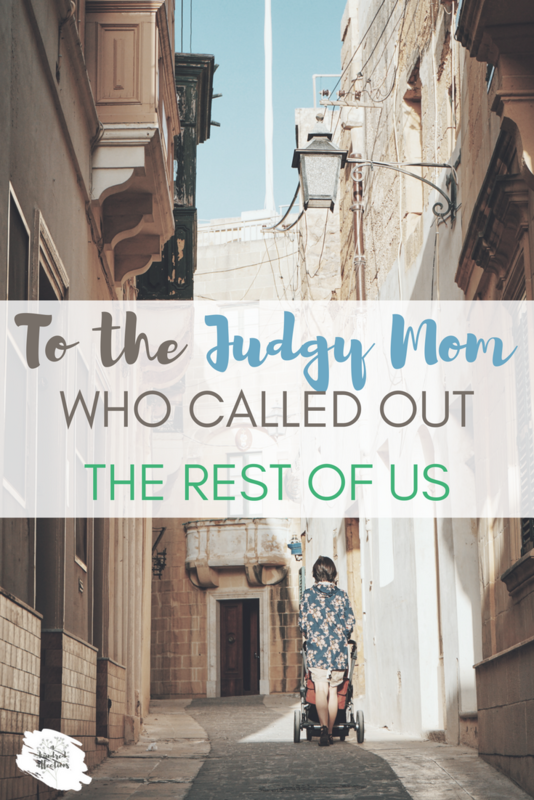 Attachment Mama, it bothered me that there was a mom out there who felt like it was OK to judge every mom who does things differently. Do you want to carry your baby? Fine. Do you want to follow the principles of attachment parenting? Great! If that works for you and your baby, have at it! Are these other babies cared for? Safe? Happy? Is what they are doing working for both mom and baby? Then let them be. We are all doing the best that we can. Enough with the labels. Enough with the criticism. Enough with the sanctimonious eye rolls and whispers behind the hand. Enough with the judgy Facebook posts and memes! It’s not helping. Anyone. Is there a mom at the park with her baby in the stroller? Maybe you have no idea what it took for her to get herself and her baby out of the house that morning. You have no idea what might be awaiting her when she gets home: financial trouble, health issues, a bad marriage. Maybe she questions herself as a mom enough already. Maybe, on most days, she already feels like she is failing at this. Maybe she would rather plop her baby in front of the TV and sneak in the kitchen to binge on potato chips because she is so stressed out. Or depressed. Or overwhelmed. But she is out with her baby. Is your judgment of her and calling her a ‘detached parent’ really helping her? You have no idea why she is using a stroller instead of carrying. Maybe the baby has hip dysplasia. Maybe she has back issues. Maybe she doesn’t want to. But who even cares why?!? She’s not a bad mom because she uses a stroller! Carrying wouldn’t make her a better mom! And she doesn’t have to defend her parenting to you or anyone else. If it works for her and her baby, it is right! Attachment Mama – no more labels. They don’t help anyone. It causes annoyance at best and self-doubt at worst. No mom needs that. I get it that maybe you want to label yourself to identify your parenting style: attachment mom, crunchy mom, natural mom – whatever. But please – don’t put your labels on others. Not all moms want to be labeled. Most of us are just moms who love our kids with all our hearts and are doing the best we can. When we judge others, we usually have the log in our own eyes while looking at the speck of dust in someone else’s. Attachment Mama – are you perfect? Do you ever mess up? Have all your parenting techniques produced perfect children? You are only seeing a fraction of this mom’s life. And carrying your baby is only a fraction of yours. Unless that child is being abused, beaten or neglected, that mom is doing a great job! One mom should never see looks of judgment, criticism or condemnation from another mom. Ever. All she should see in another mom’s eyes is empathy, understanding, compassion and solidarity. Attachment Mama, we are in this together. All of us. We have the same goals: we want to raise our kids with love, security, and character. Your methods might work for you, but they might not work for everyone. Attachment parenting might be great for you and your kids, but another parenting style might produce equally amazing little human beings. Every mom is not like you, and every child is not like your child. So, please, Attachment Mama – give the rest of us a break. What would really help is your support and encouragement. When you see a mom with her baby in a stroller while you are carrying your baby, don’t scowl in judgment. Give her a smile. Give her a nod. For the love of God, high-five her! She is out with her baby. Her baby is safe. Her baby is cared for. I’d assume her baby is dearly loved. She is doing a great job. The same goes for all the other moms out there – the mom whose toddler is throwing an off-the-charts tantrum in the middle of Target. The mom who looks like a hot mess at the bus stop – and maybe her kids do, too. The mom who already feels like she just can’t get her stuff together. These We moms need your support, not your judgment. 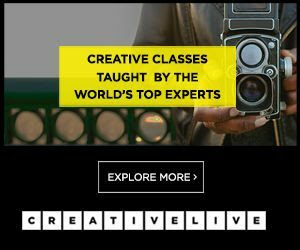 Attachment Mama – you probably are smart and have a lot of insight and information to offer other moms. That’s great – offer that – but do it with compassion, open-mindedness, and humility. But my guess is that what the other moms in your circles really need is a sister, a friend, a kindred spirit – someone who will be a shoulder to lean on, someone who will tell them they are doing a great job, someone who will let them know they aren’t in this alone in trying to succeed at this best and hardest role in the world. If you want to really helpful, Attachment Mama, offer other moms that. I don't understand why people can't be accepting of all LOVING parenting styles. Every family and child is different and we are ALL doing the best we can! AMEN to this post! Yes to all of this! Just because we mother differently does not make it wrong or bad. We are all trying to keep humans alive. Let's all be happy we are doing that. wow. you hear it all in the mom world. "your using a bottle instead of nursing?" Assuming my child is not a foster kid. "You buy from that brand?" "You dont believe in TV?" Nope I dont, not when they are 2 and under. But I've gotten to the point where I've actually told people to stop telling me how to parent. I've had strangers tell me to not let my 4 year old stand in the cart. Then told them to not tell me how to parent. shes four she'll figure it out why not to stand after I told her not to. Yes! We're all just trying to do what's practical for our situation. Every mom and family is different and we should celebrate that our children are thriving despite the judgment and criticism. Keep doing you! You do you! lol One of my husband's favorite sayings! lol Totally true. Our kids are so different, too! What works for one kid will not work for another all the time! So, there goes that parenting method, right?!? Such a learning curve - but if a child is loved, treasured, cared for and taught character, they will be just fine! Thanks for coming by and sharing, Tasheena! This is so well said!! :D I had a 25 month old and twin newborns...yep, I used a stroller. Yes, I also love babywearing. No, I was not being lazy (!!) I often find the judgy comments come when someone has had one baby (or even before they have a baby). You are so right: support not judgement. I agree 100%. Stroller or being carried. Tantrum in Target or no tantrum as moms we are doing an awesome job and shouldn't be judgy! It's hurtful when moms judge other moms for no reason at all. We all have our philosophies of child rearing. That's OK so long as we don't disdain another mom's different philosophies so long as the child is well loved. To each their own! If a mom wants to carry their child and not use a stroller, go for it. If a mom never wants to push her stroller and always has someone else do it, go for it. But don't be so dismissive of what other moms are doing. I feel like so many mamas out there are judging each other. I just talked to a friend out this as well. Why? Why are we doing this to each other? What is the point? I feel like saying "grow up"! I wonder if moms who make judgements aren't insecure about their decisions and feel the need to state their opinions strongly to cover up their own fears? I did things differently with each of my kids - strollers didn't work when I lived in Kenya, so I had to carry my son. My daughter, on the other hand, happily strolled through most of her babyhood in South Africa. They are grown and married now and I am close to each of them. We went through this... go through this so often when going to the store. It can hurt being judged. Getting unsolicited advice from judgmental - though probably well meaning -moms. We all do motherhood differently. Most of us are doing just fine! Support is absolutely what would be better. We all doubt we are doing it well. A High -5 in the super market would make my day ! I absolutely agree with you. Great article! Thank you! So nice to have others in the sisterhood! :) Thank you for coming by! I've done both, depending on how long the excursion is, whether I have bags to carry, and btw- I have a 3 year old with SPD who bolts when he gets overwhelmed! Having a wagon or stroller makes him feel safe and gives me peace of mind! I love that you pointed out "we are all doing the best we can!" Ain't that the truth! I hate how people are so into labels, like you can only be one thing. It's so much pressure on yourself, once you label yourself as attached and then you want to use a stroller, you feel like you can't. Once you label yourself as crunchy, going to mcdonalds on a desperate roadtrip is not an option. I think that's why they get judgey, they reassure themselves that they're doing the right thing by judging others. It's really too bad. I also don't get people who lack imagination so much that they can't conceive of a child not liking the carrier. Every baby and mom and relationship is different, what works for you might not work for someone else.